Walk to the shops. Pedal to the park. Cross the road to the pub. 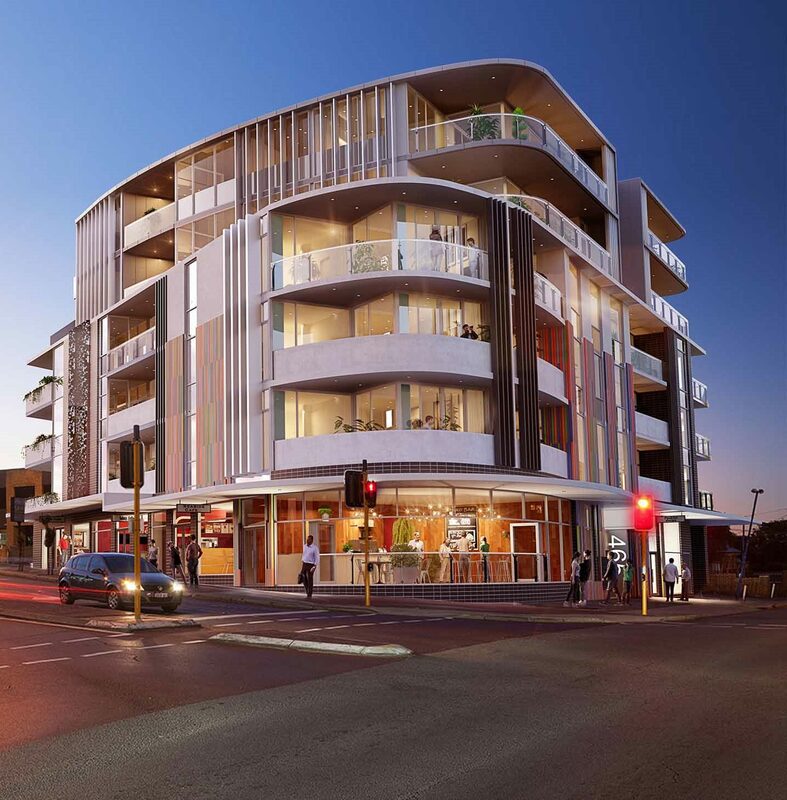 ROSE ON ANGOVE IS YOUR CHANCE TO LIVE THE LIFE YOU'VE ALWAYS PROMISED YOURSELF BE RIGHT ON THE INTERSECTION OF LIEFSTYLE AND CONVENIENCE, WITH EVERYTHING YOU LOVE ABOUT NORTH PERTH RIGHT ON YOUR DOORSTEP. There's never a dull moment when you live on Angove Street. Imagine waking up on a Saturday morning and strolling along your very own cafe strip. It's hard to go past Angove Street Collective, a new urban lifestyle concept combining everything from coffee tables to cards, cushions and coffee. Across the road you'll discover The Old Laundry, a breakfast favourite. For serious coffee connoisseurs, maybe Milkd or Metrio is more your style? Or enjoy the sweet side of life at Fiorentina Patisserie. As the day unfolds, so too do the options. Ease into the morning with a leisurely cycle to Hyde Park, just five minutes away. Then wind way back through the hustle and bustle of the Fitzgerald Street strip where you can grab a bite to eat at a host of foodie hotspots including Engine Room Espresso, Hobart Deli or No4 Blake Street. Or visit a WA barista champion at Addison & Steele. Spend your afternoon smashing out a few laps in the pool or taking a gym class as Beatty Park Leisure Centre. Then get ready for a big night out with your next-door neighbor: the Rosemount Hotel. The street of North Perth come alive as the sun goes down. Start your night out across the road at the Rosemount Hotel, or strike up a few laughs at Rosemount Bowl. Afterwards, head straight up Angove Street and drop into the Old Laundry for a drink and some tapas. Or further up the road, you can take a seat at The Classroom for a cocktail. The Hyde Park Hotel is also just down Fitzgerald Street. A little further is Mount Lawley's famous Beaufort Street. It's packed with bars, jazz clubs and the Astor Theatre. Want to catch a basketball match or concert? The Perth Arena is right up your alley. The lively streets of Leederville are also nearby with eclectic restaurants, Bill's Bar and The Garden. Northbridge's renowned nightclub hotspots like The Library, Paramount and Mint provide options for dancing into the early hours. Or drop into Pot Black for a late night game of pool, knowing your comfy bed is waiting for you just across the road. Rose on Angove sets the standard for style. The six storey fascia with glass balconies, rendered walls and striking vertical louvres is at the cutting edge of contemporary architecture, yet it feels like it belongs amongst it's heritage neighbours. Inside, it's not so much an apartment building as a collection of unique address. No floor plan is a perfect rectangle and, with 15 unique designs, very few floor plans are even repeated in the building. And you can choose from 3 different interior design scheme including Eco, Heritage or Urban. The result? Apartments as individual as you. 1. Eco: Breezy bleached Scandinavian wood tones mixed with whites. 2. Heritage: Slick, Grey bench tops contrasted with crisp white cupboards and lush walnut coloured floors. 3. Urban: Make a statement with brick tile walls in the kitchen, open industrial wire framed shelving and feature concrete look tiles. With it's sleek lines, inspired interior design touches and inviting open plan living spaces, Rose on Angove epitomizes contemporary style. Outside is a streetscape of bustling energy, colourful characters, and busy cafe kitchens. But, once you step into your apartment, you're in an oasis of calm. This is home. This is Rose on Angove. To receive your copy of the plans or to book a private viewing of the onsite showroom, register your interest below and one of our Apartment Specialist get in touch with you soon. Did somebody say central? North Perth connects you to all the city has to offer. You're right on the Angove Street strip, in one of Perth's only intact urban villages. Amazing coffee, bars, food and unique retail stores are a 30 second stroll away. You'll arrive at work in the blink of an eye, with Fitzgerald Street's taxi and bus route right on your doorstep to shuttle you directly into the CBD. And when it comes to playtime, Northbridge, Perth Arena, Mount Lawley and Leederville are all within the tantalising ten-minute zone. Fitzgerald Street takes care of all your essentials. Everything you need is just two minutes' walk down the road. From North Perth Plaza's Coles, newsagency, liquor store and bakery, to Australia Post, Chemist Warehouse and Fitzgerald Medical Practice. Studying? ECU Mount Lawley campus is just 15 minutes' drive away, and you could arrive at the Central institute of Technology TAFE in less than ten. For fitness fans, Beatty Park Leisure Centre is under a ten-minute bike ride. And, when you want to explore the action beyond, simply take an on-ramp to the Graham Farmer or Mitchel Freeway, leading you east, north or south.